It’s been a very mild fall here so far, but it’s finally starting to get cooler. Perfect soup weather. 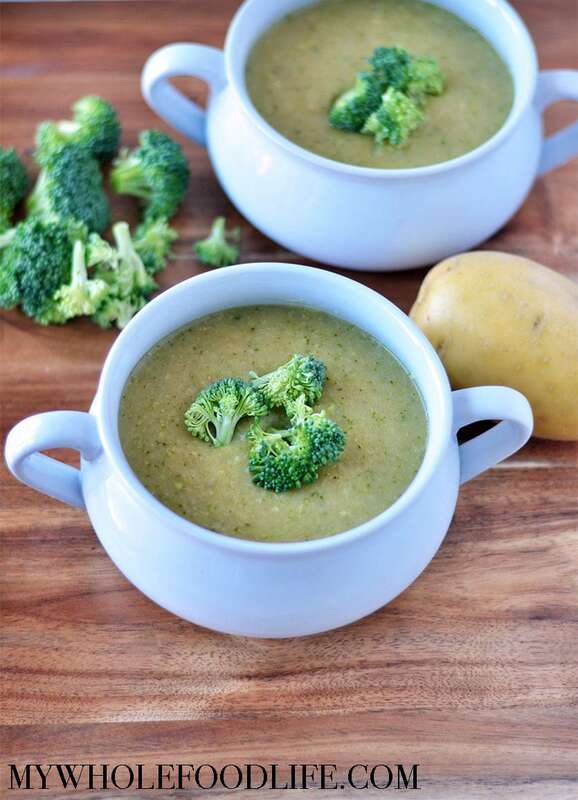 Creamy Broccoli Potato Soup weather to be exact. This soup is great because it uses potatoes to add a creamy texture so no heavy cream is necessary. Another great thing about this soup is that it only takes about 30 minutes to make. Easy peasy and totally delicious. This healthy soup recipe is vegan, gluten free and grain free. It also freezes well and it’s budget friendly. I used nutritional yeast to add a cheesy flavor, but you can omit if you like. Or, if you eat dairy, you could add a little cheese in place of it. A healthy and easy soup that freezes great. Very budget friendly too. Vegan and gluten free. In a large stock pot , on medium heat, saute the onions and garlic in 1/4 cup vegetable broth , stirring often. Add the diced potatoes, nutritional yeast, and 3 cups vegetable broth to the pot, turn heat to medium-low, cover and simmer for about 10 minutes. Remove from heat and carefully blend the soup using an immersion blender . Add the broccoli and almond milk, put back on a low temp, cover and simmer for another 10 minutes. Remove from heat, salt to taste and blend through with the immersion blender again. This should last at least 5 days in the fridge and you can also freeze it for up to 6 months. Enjoy! Those are some real good options you have given to add to this recipe! I would certainly love to add some cheese to it! Thank you so much! Ever since cutting dairy I've been searching for a recipe for "cheesy" broccoli soup - I'm really excited to try this recipe out! Can I use frozen broccoli,and if so, how much? 2lbs? Not sure a weight, but I might say 4 cups of florets? I made this in the instant pot today, without the almond milk and with less potatoes. Sauté onions and garlic, add cubed potato, broccoli, broth and 7 minute manual. QR after 5 minutes, and then blend with an immersion blender. Turned out awesome for so little work. My daughter gave it the golden seal of approval. :). I made this for dinner last night and it was fantastic! It was quick and easy and the ingredients are commonly on hand. Thank you!! Just made this, turned out great. I added a sprinkle of lemon juice and cayenne for an extra kick. Otherwise, I followed it exactly. Easy to follow, quick to make, delicious to eat. Thank you for sharing. You are so welcome Rose! Awful. I seldom make things that even I can't eat, and this is one. Sorry about that. What happened? This has had several positive reviews. Just made this. Delicious! I am such a fan of your recipes. Thank you for creating and sharing them! Hi Marie!! So glad you enjoyed the soup. I’ve added some red lentils and some frozen spinach to mine. Thanks for the recipe!